Popovich isn’t happy. Manu is hurt but the Spurs keep on winning and Timmy is still one of the most dominant players in the game. 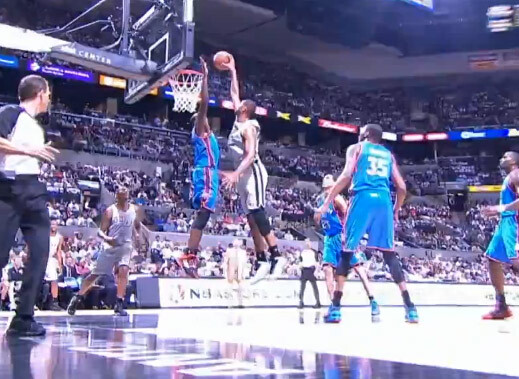 On this shocking play, Duncan dunks on Serge Ibaka who was just 8 years old when Duncan came into the league. If you remember back in the 2012 NBA playoffs between the Spurs and OKC, Duncan had a couple nasty dunks on Ibaka then too.